In 1986, Greg Hildebrandt illustrated an edition of Pinocchio for Unicorn Publishing House. This beautiful pencil layout is a final drawing created for a painting in that book. Greg used this piece to transfer to the board for his finished painting. It is a one of a kind original by Greg Hildebrandt. 'Sitting in the darkened theatre next to my mother, I waited anxiously for the film to begin. Minutes into Walt Disney's Pinocchio, I was lost in the magic and mystery of not only a puppet brought to life, but also in the creation of an entire imaginary world…Inocchio's experiences and sacrifices transformed him, just as I believe that our experiences and sacrifices transform us. Pinocchio was the first film I ever saw. It had a lasting impact on me. Its images are powerful and majestic, and it determined the course of my artistic career. I love illustrating the classics, because they continue to inspire people today as they always have throughout the years. Being able to paint the characters of classic literature as I see them has been a lifelong goal of mine. However, each time I illustrate a classic, I'm concerned because people who know the stories also have their own images of what the characters should look like. The story of Pinocchio left a deep impression on me, and I have always wanted to illustrate it. 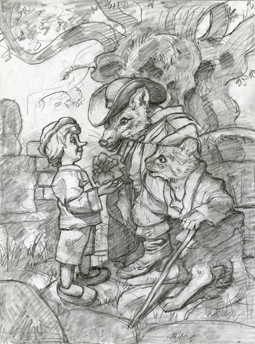 When we found this early translation of Collodi's original story, it gave me the ability and freedom to create new images based on Collodi's original works. …There was a challenge in designing the puppet so that the wooden boy could be an appealing character. To paint him so that people could relate to him, I made a puppet to pose and combined whim with a real boy…"
-- Illustrator's Note by Greg Hildebrandt in his illustrated classic, 'Pinocchio'. Of all the stories Greg has ever loved, 'Pinocchio' has had a deep and profound impact on Greg Hildebrandt, and we believe that all of the love he has for this story was put into every brushstroke of every painting.